Metal braces are the most common type. They are made of high grade stainless steel. Today's metal braces are smaller, comfortable and attractive. Many of our patients have fun with the braces changing their rubber band colors at every visit. The Invisalign System is a series of clear overlay templates—called aligners—that have been generated by computer simulation to gradually move the teeth. This system is available to adults and teenagers with certain orthodontic bite problems. Ask us if you are a candidate for the Invisalign system. 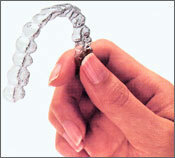 For more information on Invisalign, click here. The ligature rubber band (also called an "o-ring is a small colored elastic that holds the archwire onto the bracket. The ligatures are usually changed at each regular visit in conjunction with your adjustment. 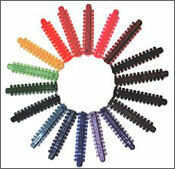 Have fun with your braces every month with all the different colors we have for your braces. Elastics are small rubber bands that patients wear between different hooks of upper and lower braces. They shift the teeth and the bite in a desired direction. Patient compliance in wearing these elastics is vitally important in both the success of treatment and the length of time in braces. Expanders are used to widen a narrow upper jaw to make room for permanent teeth, correct dental crossbites and alleviate skeletal problems in young children. By using palatal expanders at certain ages we can take advantage of bone growth and malleability prior to bone maturation. Treatment usually takes at least six months to allow for bone growth in the expanded area. Following completion of orthodontic treatment, teeth must be maintained in their newly corrected position. Teeth will always move back towards their original position, to some degree. Today, most orthodontists advise lengthy or often lifetime retention of the completed orthodontic result.